A couple of doctors traveling to a conference in Russia discover a crypt in which lays a notorious witch that they accidently bring back to life. 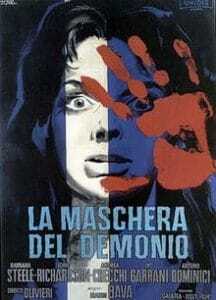 One of the top films by Italian master of horror Mario Bava, this great 60’s classic is described by many as one of the ten best horror films ever made. A great classic, but a bit overrated in my opinion. This film is a very dark one. A huge work was done on building the atmosphere and the result is a movie that radiates horror. The ambiance is incredibly heavy and a constant sense of dread emanate from the combination of gory scenes, incredible acting and dreadful music. Barbara Steele in the role of vengeful witches is already a sufficient reason to watch this movie. She is just terrific and probably one of the best witch ever. Aside from that, I found the film a little deceiving. There is not so much happening and the plot can be quickly summarized. I think this film is highly praised by cinema scholars for his cinematic qualities, but is difficult to truly appreciate for simple watchers like us. Horror newbies will probably think that it lacks a little entertainment; at least this is what I thought. Whether you like it or not, this film makes a strong impression on its viewer, especially afterwards…which is probably what is important in the end.